This larger-than-life Ghost is sure to get the attention of your neighbors and Halloween visitors! 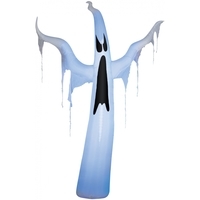 Airblown Giant Light-up Draped Ghost self-inflates in seconds, stands 12 ft tall! Stakes and tethers included.